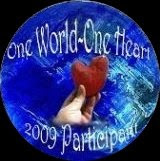 I first wanted to take an opportunity to thank Lisa for hosting the 3rd annual One World~One Heart Extravaganza! It has brought all of us bloggers together to meet one another and to share some awesome ideas. Thank you Lisa and I can't wait until next year! Info about the event and what I had up for grabs is here. Karla at Day Dream Studios! Congratulations Karla and thanks to everyone who entered in my drawing. It was a wonderful experience and I can't wait to start carousing around your blogs now!